As a little girl Khadijah Ismail would spend hours watching aeroplanes through the window of the attic bedroom she shared with her sister near Manchester Airport. She even wrote the airport a letter "on fancy paper and everything", giving her address and asking them to send more planes past her house. The eldest of four children, Khadijah loved maths and got a scholarship to a highly academic private day school. Her mum and dad hoped she would be the first in the family with a university degree. At 16 she won a prestigious Arkwright Engineering Scholarship and put the award, of several hundred pounds, towards buying a robot for her school. But her A-level choices left her parents puzzled. For Khadijah, maths and physics were no-brainers, but she desperately wanted to do A-level electronics, which was not offered at her all-girls school. The only option was to become the only girl doing electronics at the boys' school next door. Her parents feared she wouldn't thrive in an all-male environment, but she talked them round by explaining that no other A-level subject "was calling out to me". Only a few hundred students take A-level electronics each year, usually about 5% of them girls, and from this year only one board will offer it. The boys' school was a shock: "I could just smell boys' armpit smell, honestly, just genuinely the first thing I remember. "They stare at you because you're different. You're not a boy. You wear a headscarf." "I didn't have the confidence at the start to talk in class and contribute usefully, or even for my own benefit, ask questions to help me understand." But "as soon as I got stuck in and really involved, I was like: 'Wow this is amazing,'" and her enthusiasm carried her through. Why are there so few female engineers? Khadijah was offered places at top universities but, instead, applied for a five-year degree apprenticeship in aerospace engineering with BAE Systems. There were more discussions with her parents. "I explained that I'm still getting a degree with this degree apprenticeship. I'm just getting more practical experience as well." In the end her mum not only helped with the application but, when Khadijah got the job but failed her driving test twice, she drove her 50 minutes each way, every day, to the training centre at Samlesbury in Lancashire. She was the only girl in her school that year to take an apprenticeship. Overall, only 8% of UK engineering apprentices are female, although BAE itself performs better, with 26%. BAE also wants more apprentices from black and minority ethnic groups but so far they make up only about 4% of the total. 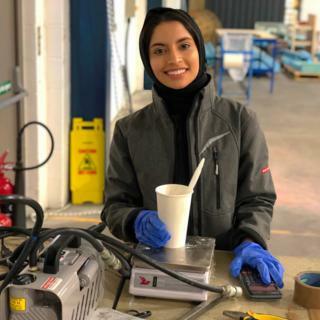 "My mum wants me to be a pioneer - to be able to wear a headscarf and be confident wearing it, and be a role model for any Muslim girl that's scared to take engineering." Now 20, Khadijah is in her second year, and has passed her driving test. She usually brings her headscarf to work but doesn't always wear it, even though "it's part of my identity." She believes boosting diversity in engineering will have huge benefits: "Different types of people have different types of thinking... having a different way to approach something is useful." She herself gives up her free time to work with The Smallpeice Trust, which runs the Arkwright Engineering Scholarships, to give talks in schools and mentor teenagers with engineering potential. Smallpeice Chief Executive Dr Kevin P Stenson says people like Khadijah are crucial to ending the stereotype that engineering is for boys. "There is a huge shortage of engineers in the UK... we therefore need to recruit as many people as we can which means you need to recruit from 100% of the population. "Female students, state school children, black and minority ethnic students, they are all under-represented, and engineering is for everybody in the UK, so we have to show and reflect that in our programmes." For the past four months Khadijah has been seconded to Prismatic in Hampshire, hundreds of miles from home, part of a team collaborating with BAE Systems on a high-altitude, long-endurance, solar-powered communications drone. "It's got the potential to stay up in the stratosphere for one full year without ever landing," she explains. "The big thing about it is it's cheaper than an aircraft and cheaper than a satellite and it's very light, which is why it's such a big deal and this is genuinely the future of unmanned aerial vehicles." At Prismatic, which has only 30 employees, she has the chance to work on all aspects of the drone. "It's everything... the design, all the way to building it, to flying it." A few weeks ago, she took part in the trial flight of a quarter-sized prototype. Last year, at her first placement, at BAE's Warton site, her office overlooked the runway, perfect for watching Typhoon fighter jets take off and land. "Things like that you would never see if you were just at uni." Once she finishes, Khadijah will have a bachelors degree in aerospace engineering from Lancaster University, and a diploma in manufacturing. Her career trajectory could even take her into the space sector, although she thinks actually being an astronaut might be out, as she doesn't meet the height requirements. Ultimately, she says, she wants to be expert enough that people will come to her for solutions to complex technical problems: "I want to be valued enough that people will listen and it will work..."
"I want to be a person where people look at me, well Muslim girls or Asian girls or anyone who's scared to take engineering in that demographic, and think it's possible and do it. That would feel really good."